TresorParken® is the exclusive premium parking service at Frankfurt Airport, which our customers have been able to book since 1989. Online booking has been available since February 2018. Do you travel a lot? Is time precious to you? Then don’t look any further. At TresorParken® we offer you a maximum of safety and convenience when parking right at Frankfurt Airport at very competitive prices. 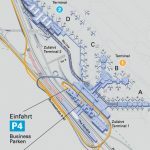 Frankfurt Airport Center (FAC): 3 min. Park your car at extra wide parking spaces behind reinforced doors in a secured area, right next to Terminal 1 at Frankfurt Airport. Experience a new kind of Valet Parking at Frankfurt Airport. Choose our Valet Parking service, and you may add extra services on top such as the Fraport VIP Service to get the best and most convenient service currently available at Frankfurt Airport. On request, we take care of maintenance tasks, repairs, tyre change or even arrange for an inspection by the German Technical Control Board (TÜV). Please contact our business partner for Automotive Service at the Airport to make an appointment, so that your car is ready on your return. We offer a full range of car maintenance and car care services at Frankfurt Airport. While you are away, we will take care of the time-consuming task of maintanance and cleaning of your vehicle inside and outside. Maybe you got a voucher for car parking or car care as a gift. Great! Just book our Valet Parking Service at Frankfurt Airport and you will return to a car that is sparkling and in mint condition. No more time-consuming appointments for car maintenance or cleaning. 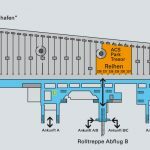 Parking at Frankfurt Airport made easy: Your satisfaction is at the heart of ACS. You are going on holiday or on a business trip and are looking for the safest, most convenient parking? Park your car directly at Frankfurt Airport behind reinforced doors in our ParkTresor at Terminal 1. In addition to our regular parking service TresorParken®, we offer our most convenient Valet Parking Service at Frankfurt Airport. If you are under time pressure or look for a service that is even more stress-free, choose our Call Valet Parking Service. Valet Parking at Frankfurt Airport means that none of your time is lost walking or waiting for us. Instead, we will come to you. Our friendly and reliable valet will receive the car from you at the entrance of Terminal 1 or 2, and park it in our safe and secure ParkTresor, while you are away. There is no better way to park at Frankfurt Airport. Our professional service team at Valet Parking at Frankfurt Airport guarantees high level security and maximum time saving. You can start your holidays or business trip with a peace of mind knowing that your car is in safe hands with us. 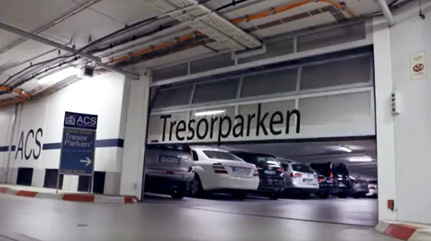 TresorParken® by ACS: Parking at Frankfurt Airport as safe and comfortable as it can be. 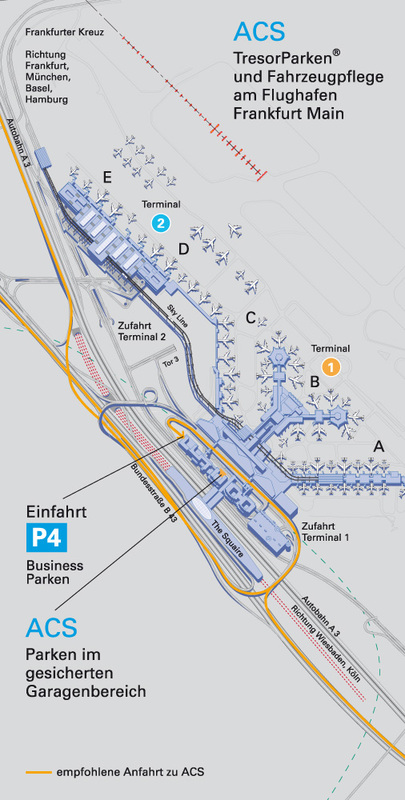 To use our Parking Service at Frankfurt Airport, please follow the signs ‘Business Parken‘. 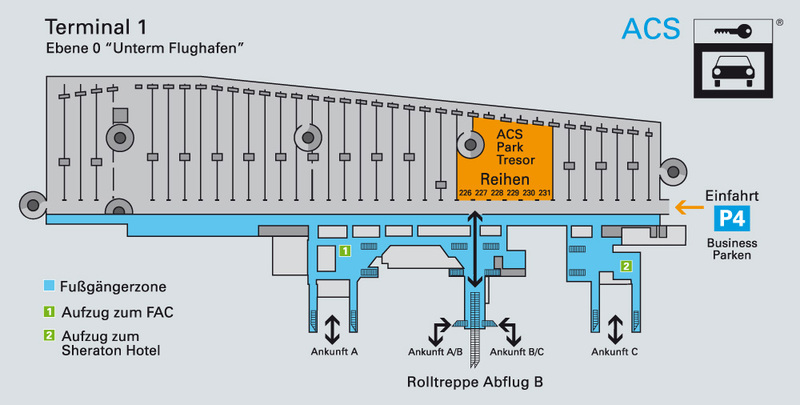 After turning to car park P4 at Terminal 1, you will see our signs ‘ACS TresorParken®’. Upon your arrival our service staff will greet you, and guide you to a parking space behind reinforced doors. Do you still have any questions, or need further information?